This listing is for a high quality Self inking (also called PreInked) Shiny mini Stamp that lasts for over thousands of stamp impressions, before needing to be re -inked. • Self Inking Rubber Stamp With the text "REJECTED"
• Approximate Impression Area 14 mm x 38 mm OR 9/16" X 1 1/2"
• Imprint size might vary slightly. 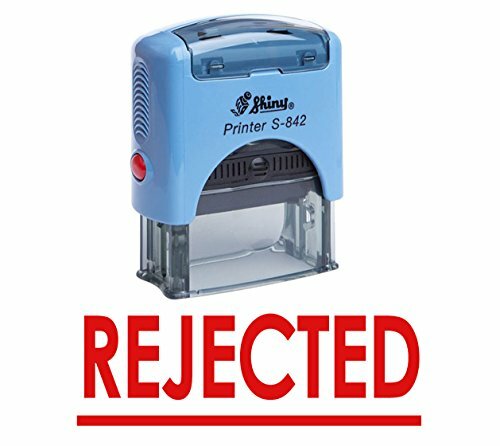 Self Inking Rubber Stamp With the text "REJECTED"
INK COLOR: Black/ Blue/ Red/ Violet. You can select the required ink color from the given variation or mail me the ink color along with you customization details. You will receive "Usage & Care Instructions" with your stamp order as shown in one of the image. View More In Labels, Indexes & Stamps. If you have any questions about this product by Printtoo, contact us by completing and submitting the form below. If you are looking for a specif part number, please include it with your message.